Terry McPhillips has stressed the importance of getting back to winning ways at Bloomfield Road in what he dubbed a “massive game” against Plymouth Argyle on Saturday. 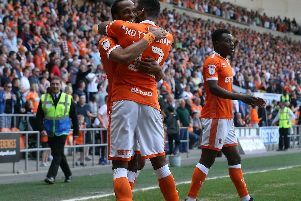 The Seasiders have claimed just one home win in 2019, the 2-0 victory against Walsall at the start of February. But McPhillips is hoping his players can build on last weekend’s 4-1 thrashing of Bradford City in front of a packed home crowd. The Pool boss said: “It’s really important now to get that win at home. “I thought we should have won the Southend game but in the end it was a last-gasp (2-2) draw. Doncaster Rovers won their midweek game in hand to extend the gap between Blackpool and the play-off spots to four points with seven to play. With time running out, McPhillips admitted Blackpool can’t afford to lose to the Pilgrims tomorrow. “I think if Doncaster win (at home to Walsall), ours does become a must-win game,” he added. “But it’s just about what we do for ourselves. It’s a massive game and we need to win. “We have some tough fixtures coming up but I think we’ve proved it doesn’t work like that – we can go to the top of the league and win, like we did at Portsmouth. “We’ve had some really good away performances against the top sides, while we haven’t done as well against some sides in the bottom four. Asked if he has a points target in mind to finish in the top six, McPhillips joked: “Yes, loads – 21 points from the next seven games. “It’s a cliche but you take each game as it comes and this one is very important. We’ve had loads of obstacles this season but we get by. “Saturday is a big game now because we have to show we can back up that win at Bradford and make it even better by getting three points against Plymouth. “It’s fair to say you’re getting to the stage of the season when you’re checking the results on your phone as soon as you get into that dressing room. “But there will be no point doing that on Saturday if we’ve lost, so we have to win against Plymouth. That will be massive for the team and the fans.